I was prepared to breakdown the entire 7-round NFL Draft today, then the Red Sox swept the Bronx Bombers right out of Fenway Park, so we'll be switching gears now. On Monday morning the New York Yankees must have that same look on their face that Republicans had on theirs when Sarah Palin was placed on John McCain's ticket. In their heads the CNN stock ticker ran by saying "I guess we've tried anything, maybe the worst idea will work." In the Yankees case, they tried winning by bringing in their stopper, Mariano Rivera, that didn't work. The Yankees then turned to their offense, get to Josh Beckett early and often while $82.5 Million A.J. Burnett shows the Red Sox what he has. Six run cushion wasn't enough, Yanks go back to the drawing board. Alright, send out the veteran Andy Pettitte to dominate Sox hitters while our offense gets after the young Justin Masterson. Sox "young" pitching allows just 1 run, and the Yankees are headed back to New York, hat in hand. It's fair to say that everyone in the Red Sox organization, from Theo Epstein to Terry Francona, is on the same exact page. Two-straight come from behind wins, and then show off at the end. What!?!?! You buy that the Red Sox just wanted to rest their bullpen? You buy that there wasn't anything else behind shuffling out the likes of Hunter Jones & Michael Bowden in a 3-run game on Sunday Night Baseball? Two pitchers with jersey numbers in the 60's who have about as much major league experience as both you and I? Maybe it's a more convincing argument if this game takes place in September, but this is the Yankees and despite what we want to think, even these games matter. Let me break this down for you, the Sox didn't land the high-price free agents this hot stove season, they had their limits and stuck to them. The Yanks went out and paid top dollar for every player they coveted, A.J. Burnett, C.C. Sabathia and most notably, Mark Teixeira. You know why the Red Sox didn't do that? Not because they didn't have the cash flow, trust me I've been to two games this season, they have the cash flow, it's because of what they have in their back pocket. A minor league system flush with talent that can be applied late in the season, mid-season call ups, and or trading chips. On Sunday night, they put that out there for display in front of a national audience against their hated rival. We'll call up these guys who will be here for all of 9 hours, they'll dominate your hitters, and then we'll send 'em back to the farm. Michael Bowden throws two innings, allows no hits, and strikes out two. Hunter Jones comes in with tying runs in front him, and gets out of the jam. This is why the Red Sox have won two championships over the past several years, and the Yankees are still scratching their heads. How many teams in the majors have their #3 hitter hitting just .222 in the midst of his worst power struggle of his career, while their clean up man is .439 and leading the majors in batting average? I'll tell you how many, one. Despite the struggles of David Ortiz, the once mammoth slugger now turned singles hitter, first baseman Kevin Youkilis is scaring opposing pitchers more than any hitter this side of Albert Pujols. Youuuuuuuuuuuk is leading the Red Sox, winners of ten straight, in batting average, home runs, on base percentage, hits, and total bases. With David Ortiz yet to hit a home run, Youkilis has five, including his walk off home run to send the Yankees back to their hotel winless on Friday night. It's hard to argue that the Sox first baseman isn't the most valuable player in the American League, it's even harder to argue that he can't carry the Red Sox to their third title since 2003. The man who can play nearly every position on the field is a better hitter than any other in the American League, that includes you Alex Rodriguez. I understand he may be the greatest closer in baseball history, for this columns sake, we'll call him that. 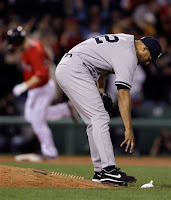 Mo Rivera is the greatest closer in baseball history. You happy? However, in this ballpark, against these Red Sox maybe you could do the man a favor and give him a few nights off. Opening Day 2005, the Red Sox faithful give him a standing ovation for coughing up the ALCS to them just months earlier. Friday night, a two-run lead against a Red Sox who hasn't even worn the jersey for 12 whole months, he coughs it up again. The core of these Red Sox hitters have seen this closer more than any other in their careers, when Rivera comes jogging from the pen, their eyes light up. This isn't Yankee Stadium, we aren't selling fruit cups in the bleachers and Enter Sandman isn't ringing in our ears, when Mariano comes in the game at the Fens, we know it isn't over. Refill our cups, this one is going into extras. Are we at all surprised when Jason Bay launches a two-out game tying home run deep into the Massachusetts night? Everyone from the grounds crew to the scoreboard operators know that the Sox still have a shot when Rivera is in the game. He may be the best closer of all time, but once on Yawkey Way, he doesn't stand a chance.